The new batch of artwork is done, and the CD's should be arriving in shops ready for Christmas. There was practically a Holy Family High School reunion at the Corbett household, 4 people from the same school, all 21 in one weekend! anyway Nick H and I got a little tipsy and played a few songs (badly!!!) on a keyboard & an old guitar, but hey it was a laugh! We also had a little practice the next day and had a go at 2 new songs. Still no definite news on our gigs over Christmas, but the dates will get posted ASAP. So much has happened where do I begin! The first batch of CD's has sold really well, I haven't even got a copy for myself! We are getting a new batch of artwork done in the next 2 weeks, and hopefully another batch of CD's to go with them. The gigs we did over the summer went quite well, considering how little time we had to practice together. We headlined The Cavern Saturday thing, we played with Classic Beat (again) and The Steve Siren Street Band which was nice as met them the week before at The Lomax event. We played at The Lomax during the Beatles festival, which was really good because of all the great bands that have played there, it seemed really weird being back stage at The Lomax waiting to go on stage where people like The Longpigs have played. 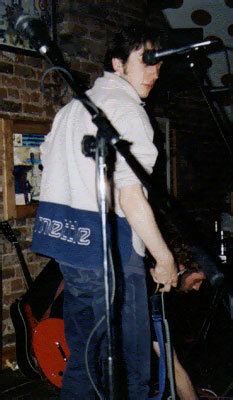 Later that day we played at Stamps in Crosby. It was really good, we were a lot more relaxed, and we played a mellower set. Sam has just gone off on a (star) trek around Australia, so if you see him say "Hi, are you Sam from Milk?". Here!! !, HMV (Manchester & Liverpool), Probe (Liverpool), Quirks (Crosby & Formby), and Piccadilly Records (Manchester). my baby tuesday, mullet, rachel, the getaway, might be living, brook and it's about time. At the moment we're sorting out getting CD's & artwork done, it should be available over the next couple of months on this site, HMV Liverpool, Quirk's & Probe for about £5/£6 we're trying to keep costs down but still give you a high quality product so there's virtually no profit from it so that you will take a chance on us!! We've just finished our stint of Christmas touring! everything went really well which was surprising! We didn't get into the studio, but we'll hopefully sort something out over Easter. The only new original song we did was 'it's about time' but we did a few new covers to spice things up a bit. We also played at Den (-Sam's step dad)'s retirement do, which was nice. Unfortunately Hendy was back in Newcastle at the time, so we had to make do without him, but Ben the mysterious 'fifth' member joined in with his synthesizer to make strange noises! There were also a couple of guest appearances from that famous acappela group 'Den & the Daleks'. A good time was had by all and there'll be some new pictures up on the site soon.